Dept. of Civil & Environ. Engg. School of Eng. Design & Tech. 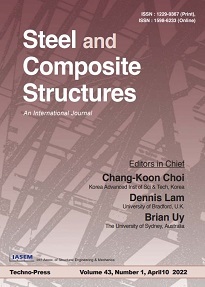 Steel &	Composite Structures, An International Journal,	provides and excellent publication channel which reports the up-to-date	research developments in the steel structures and steel-concrete composite structures, and FRP plated structures from the international steel	community. The research	results	reported in	this journal address all the aspects of	theoretical	and	experimental research, including Buckling/Stability, Fatigue/Fracture, Fire	Performance, Connections, Frames/Bridges, Plates/Shells, Composite Structural Components, Hybrid Structures, Fabrication/Maintenance, Design Codes, Dynamics/Vibrations, Nonferrous Metal	Structures, Non-metalic plates, Analytical Methods. The	Journal	specially wishes to	bridge the gap between the theoretical developments and practical applications for the benefits of	both academic researchers and practicing engineers. In this	light, contributions from the practicing engineers are	especially welcome. In this paper static analysis of FGM cylinders subjected to internal and external pressure was carried out by a mesh-free method. In this analysis MLS shape functions are used for approximation of displacement field in the weak form of equilibrium equation and essential boundary conditions are imposed by transformation method. Mechanical properties of cylinders were assumed to be variable in the radial direction. Two types of cylinders were analyzed in this work. At first cylinders with infinite length were considered and results obtained for these cylinders were compared with analytical solutions and a very good agreement was seen between them. Then the proposed mesh-free method was used for analysis of cylinders with finite length and two different types of boundary conditions. Results obtained from these analyses were compared with results of finite element analyses and a very good agreement was seen between them. FGM; cylinder; stress; mesh-free; MLS shape function; FEM. This paper is an experimental study on the behavior of vertical shear link in normal (steel section with and without stiffener) and composite (steel section with concrete located at the area limited to web and flanges of the section) configurations. This study is mainly aimed to perceive failure mechanism, collect laboratory data, and consider the effect of number of transverse reinforcements on strength and ductility of composite vertical links. There have been four specimens selected for examining the effects of different details .The first specimen was an I section with no stiffener, the second composed of I section with stiffeners provided according to AISC 2005. The third and fourth specimens were composed of I sections with reinforced concrete located at the area between its flanges and web. The tests carried out were of quasi-static type and conducted on full scale specimens. Experimental findings show remarkable increase in shear capacity and ductility of the composite links as compared to the normal specimens. Local buckling can be ignored for hot-rolled ordinary strength steel equal angle compression members, because the width-to-thickness ratios of the leg don\'t exceed the limit value. With the development of steel structures, Q420 high strength steel angles with the nominal yield strength of 420 MPa have begun to be widely used in China. Because of the high strength, the limit value of the width-to-thickness ratio becomes smaller than that of ordinary steel strength, which causes that the width-to-thickness ratios of some hot-rolled steel angle sections exceed the limit value. Consequently, local buckling must be considered for 420 MPa steel equal angles under axial compression. The existing research on the local buckling of high strength steel members under axial compression is briefly summarized, and it shows that there is lack of study on the local buckling of high strength steel equal angles under axial compression. Aiming at the local buckling of high strength steel angles, this paper conducts an axial compression experiment of 420MPa high strength steel equal angles, including 15 stub columns. The test results are compared with the corresponding design methods in ANSI/AISC 360-05 and Eurocode 3. Then a finite element model is developed to analyze the local buckling behavior of high strength steel equal angles under axial compression, and validated by the test results. Followingthe validation, a finite element parametric study is conducted to study the influences of a range of parameters, and the analysis results are compared with the design strengths by ANSI/AISC 360-05 and Eurocode 3.
local buckling; high strength; steel equal angle; axial compression; Q420; finite element analysis. laminated composite; compression; fiber-kinking; matrix failure. The effect of element interaction and material nonlinearity on the ultimate capacity of stainless steel plated cross-sections is investigated in this paper. The focus of the research lies in cross-sections failing by local buckling; member instabilities, distortional buckling and interactions thereof with local buckling are not considered. The cross-sections investigated include rectangular hollow sections (RHS), I sections and parallel flange channels (PFC). Based on previous finite element investigations of structural stainless steel stub columns, parametric studies were conducted and the ultimate capacity of the aforementioned cross-sections with a range of element slendernesses and aspect ratios has been obtained. Various design methods, including the effective width approach, the direct strength method (DSM), the continuous strength method (CSM) and a design method based on regression analysis, which accounts for element interaction, were assessed on the basis of the numerical results, and the relative merits and weaknesses of each design approach have been highlighted. Element interaction has been shown to be significant for slender cross-sections, whilst the behaviour of stocky cross-sections is more strongly influenced by the material strain-hardening characteristics. A modification to the continuous strength method has been proposed to allow for the effect of element interaction, which leads to more reliable ultimate capacity predictions. Comparisons with available test data have also been made to demonstrate the enhanced accuracy of the proposed method and its suitability for the treatment of local buckling in stainless steel cross-sections.